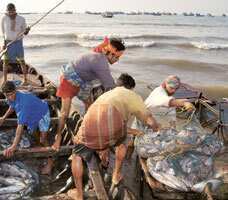 Troubled waters: A file photo of the Shankarpur fishing harbour in West Bengal. Tuna exports rose to more than 32,700 tonnes in 2007-08. AFP. Kochi: Tuna fishermen and processors are up in arms against a government proposal to continue allowing foreign vessels to fish in Indian waters and transfer the catch mid-sea. The Marine Products Export Development Authority, or MPEDA, also made a similar proposal and held discussions with the agriculture ministry. The commerce ministry, however, may continue with the existing practice of giving foreign vessels letters of permit, or LoP, to fish for tuna, said Dominic Sebastian, managing director of Kochi-based Moon Fishing India Pvt. Ltd, a joint venture with Japanese firm Moon Marine International Co. Ltd.
“Worse still, the practice of transfer of tuna in the mid-sea to other vessels going to Japan, Thailand and China will continue," he said. “This will deprive the processing plants here of sufficient material." “Also, there will be distress sale. Presently, some of the boats are forced to sell their catch at $3-4 (Rs139-186) a kg at mid-sea when the ongoing price is around $8-10," Sebastian said. Abdul Ziyad, managing partner of Chennai-based Allied Exim Foods, said vessels with LoP should not be allowed to make mid-sea transfers but should land at Indian ports instead. This will not only ensure better prices but also sufficient material for the processing units here, he said. “The government should take steps to provide sufficient cold storage containers for preserving the tuna caught," he added. After pulled out of the water, tuna must be killed and frozen immediately to preserve the quality of the meat. Tuna fishing boats are, thus, customized with cold storages, and costs around Rs35 lakh each. MPEDA subsidizes the conversions. Tuna exports rose to more than 32,700 tonnes worth some Rs196 crore during 2007-08, compared with 23,788 tonnes worth Rs130.38 crore the previous year. India’s total seafood export in 2007-08 was worth Rs7,570 crore.